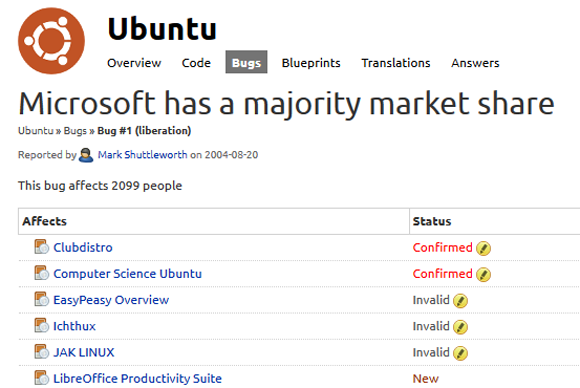 Open-source advocate Mark Shuttleworth closed Ubuntu’s seriocomic Bug #1 report on Thursday after leaving it open nearly nine years. The move heralded a major shift in rhetoric from the leader of the world’s most popular Linux distribution. Shuttleworth, a former Debian developer, founded Canonical Ltd.in 2004 to work on Ubuntu, at that time a brand-new new Linux variant. More of an Ubuntu mission statement than an actual error, Bug #1 for years served as a tongue-in-cheek summary of arguments in favor of open-source software. The comment in question is just as optimistic as the original bug report was cynical. “Personal computing today is a broader proposition than it was in 2004,” says Shuttleworth, citing Android’s popularity as proof. “Circumstances have changed, institutions have adapted, so should we,” Shuttleworth said. We’ll see whether his decision is supported by Ubuntu’s fellow open-source compatriots. So far the closure has touched off an argument in the bug report’s comments, with an equal amount of supporters and detractors. One user even went so far as to say, “The closure comment reads like something agreed to as part of a deal with Microsoft,” confirming that the more things change, the more they stay the same.